Thanks, Mail Carrier | Redbox Wants To Know: Who Is The Star Gamer In Your Family? Redbox Wants To Know: Who Is The Star Gamer In Your Family? Last month my family joined the kazillion other people out there who already knew and loved the convenience of watching movies with Redbox. I'm still not sure why we hadn't tried these simple self-serve kiosks out before, but now that we have, we're hooked. It is just so easy to browse online and, with multiple locations near us, we're sure to find a title that will satisfy the whole family. So what else can Redbox do to celebrate summer fun? More than just movies, they have a great (and huge) collection of games that are sure to bring out the fun, competitive side to all ages! 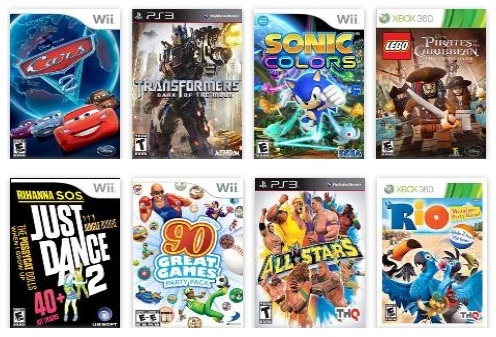 With all of these great games in mind, Redbox is asking moms, "Which member of your family is the best at video games? Who’s the worst?" Plus, they are rewarding two lucky people with a chance to win $10,000 as part of the Redbox Summer of Fun & Games Sweepstakes.Who wouldn't like a bonus like that to liven up their summer? As Big Sister E and Little Sister B are a little on the young side for video games, they don't have a lot of experience quite yet (but I'm sure that will change in the future). I have to admit that my husband probably has considerably more video game skills than I do... so I had better get practicing so that I can hold my own the next time we are trying to show off! What about you? Who is the star gamer in your household?